This pile of about 25 pancakes lasted only about 5 minutes between 3 people, even with two other dishes on the side. The 3 mushroom filling was so light and savoury, especially when combined with the slightly salty rice pancake, it felt almost as if we hadn’t eaten them. 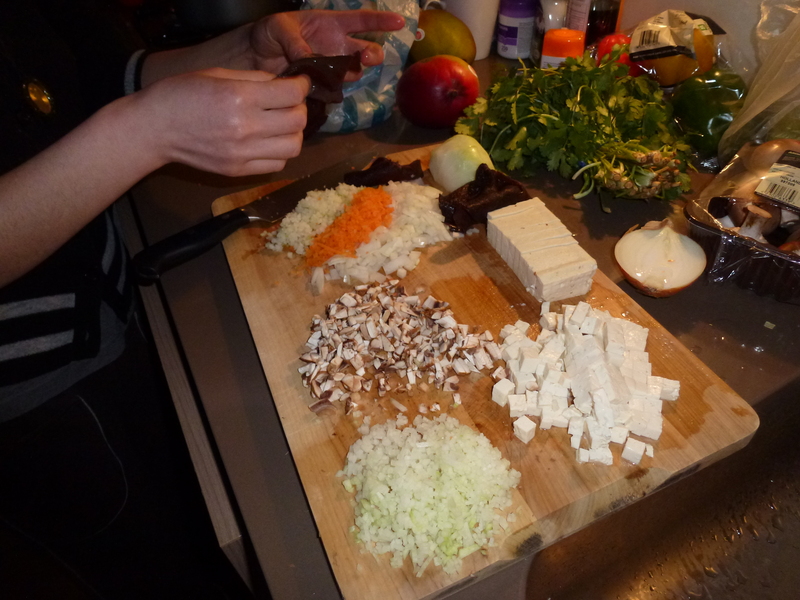 Last Sunday I was lucky enough to be invited round to my new friend Lily’s – Vietnamese cook and food marketer extraordinaire – where together we made a veritable feast of Vietnamese food. 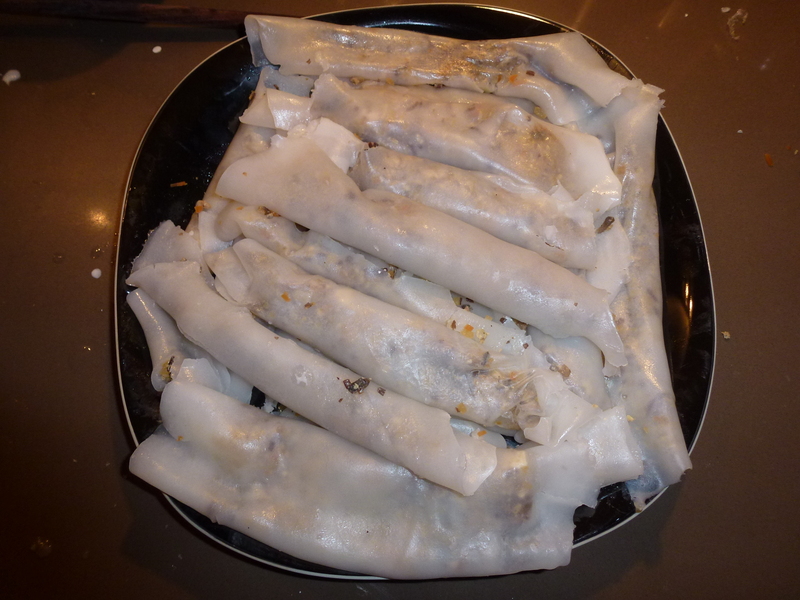 Using Lily’s own meat recipes as a starting point, we made Bánh Cuốn – translucent rice flour stuffed pancakes – using a non stick frying pan. Instead of shrimp or pork, however, we made a frankly delicious filling made from mushrooms, with 1 egg, a little tofu and a little bit of carrot and kohlrabi. Lily also made a separate dish tofu with fresh tomatoes (see next post) and an excellent Mango salad, which you might recall is a recipe I got from Lily in the first place. This was supplemented by copious fresh fruit like Chinese grapefruit (pomelo), custard apples, mandarins and extra mangoes. And considering it was still January and therefore epiphany in the French calendar, I brought over a homemade Galette de Rois made with puff pastry and almond frangipan, to finish our meal off! 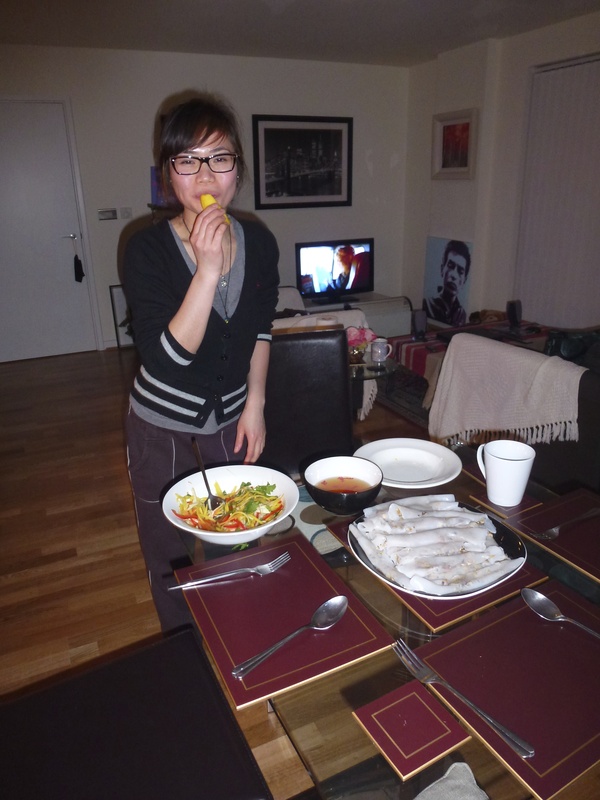 Lily is an excellent cook and an excellent person, and we plan to do a weekly Sunday Vietnamese cooking session at hers, so in effect I can tick off one of my life dreams as achieved. Expect Banh Xeo next week, and Banh Chung for Tet the week after! Recipe (Serves 3-4 with other dishes). 200g steamed pancake flour – comes in packs of 400g at Vietnamese supermarkets, mainly consisting of rice flour and salt. 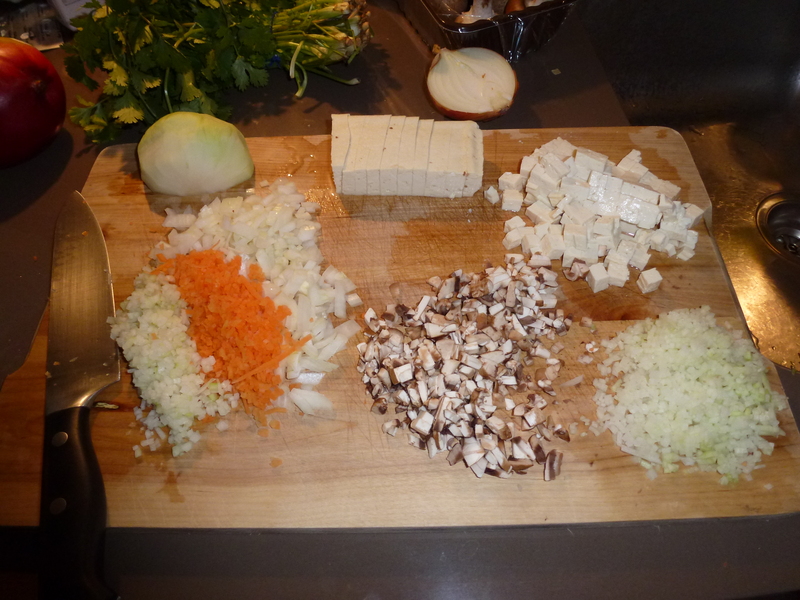 50g tofu, chopped into small cubes or crushed. 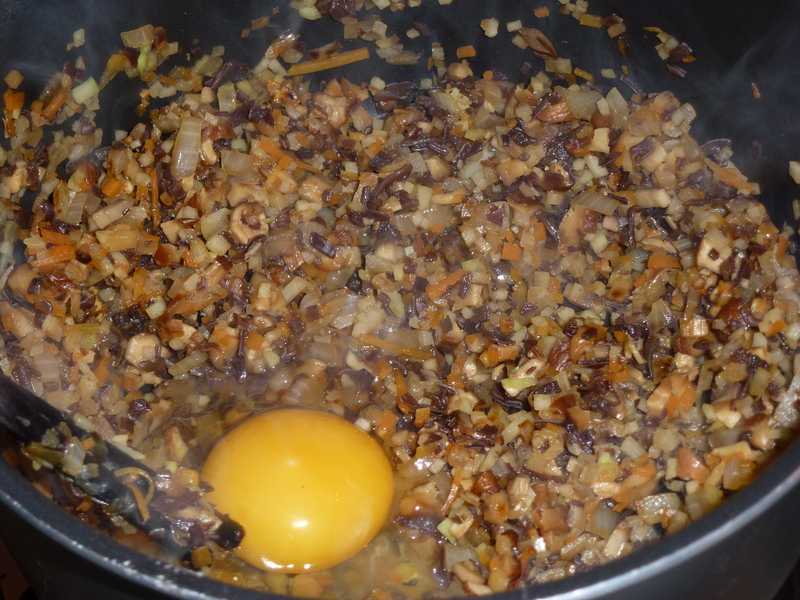 Fry all the chopped ingredients together in the oil on a low-medium heat in a saucepan for 8-10 minutes, adding the egg to the mix about half way in. 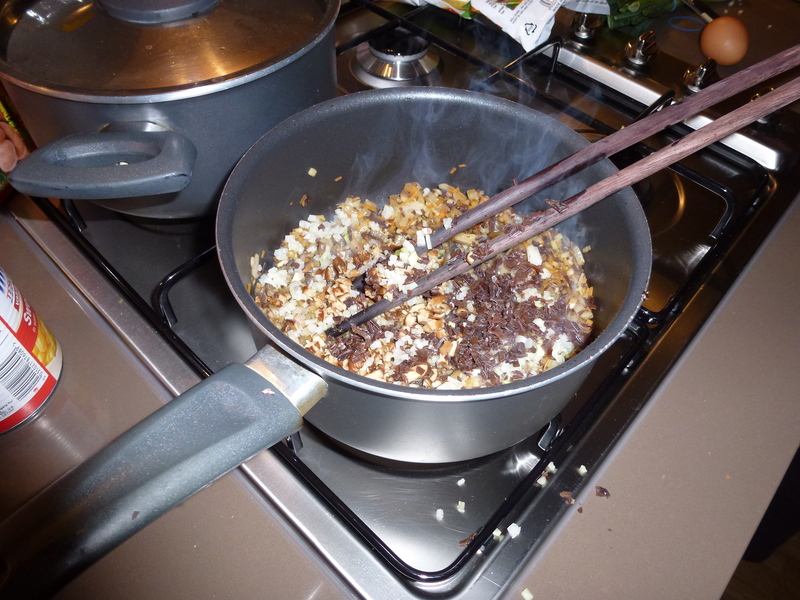 Once the vegetables are tender, the onions sweet and translucent, season the mixture to taste and set aside. 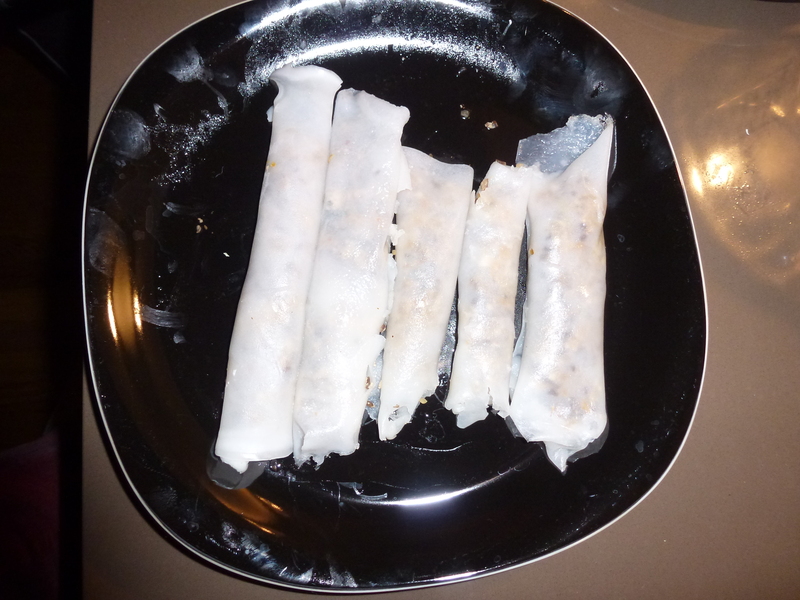 Mix the Banh Cuon flour with the water until there are no lumps left in the batter. 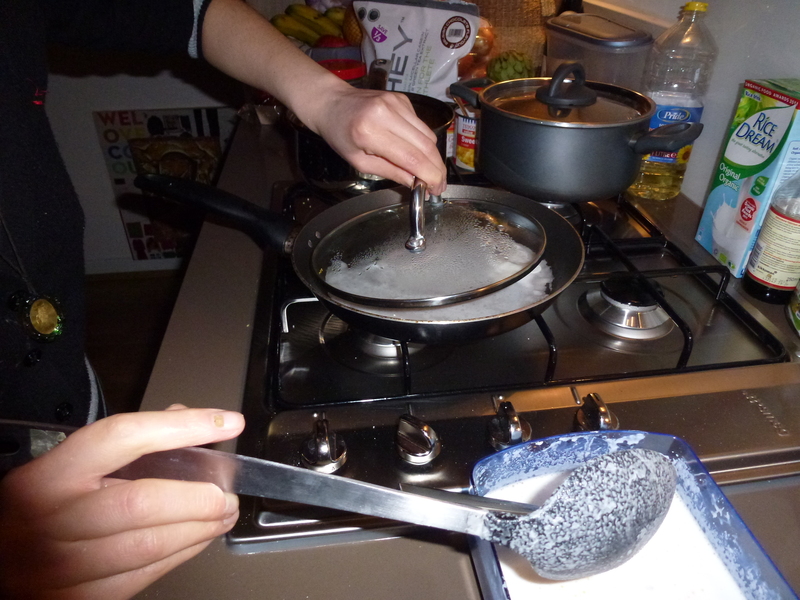 Brush oil in a non-stick frying pan and heat it on a low heat. 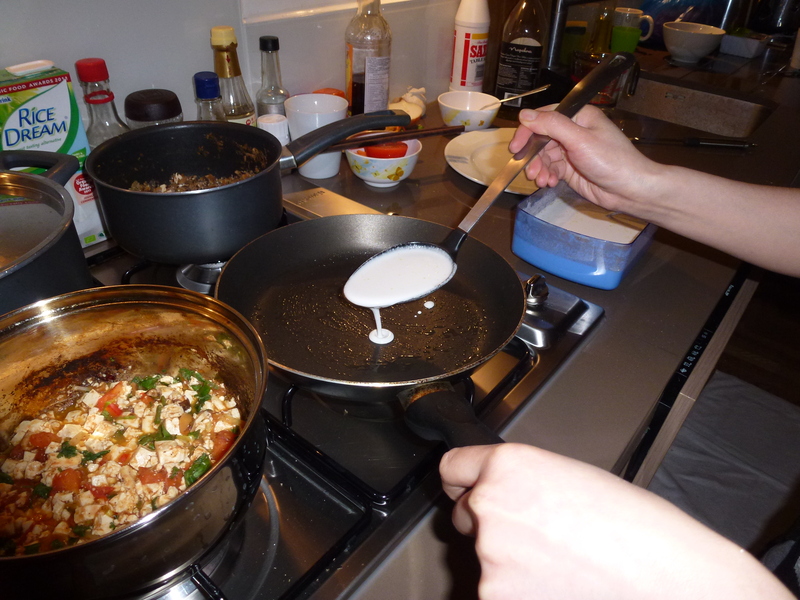 Add about half a ladle of the batter to the pan, turning quickly to ensure the bottom is evenly coated. 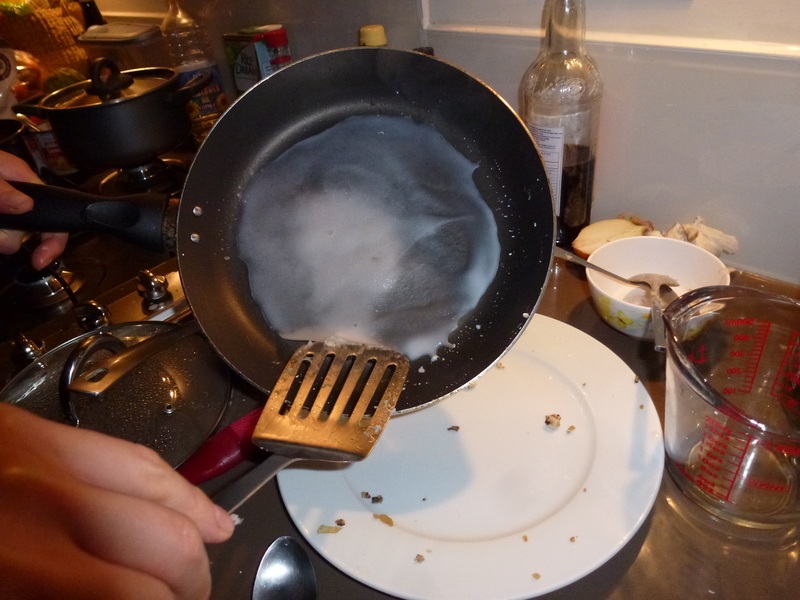 Put the lid of a saucepan over the frying pan in order to steam the top half of the pancake. Once the pancake is translucent and you can see quite clearly through it, carefully transfer it onto a plate to be rolled. Split the pancake in half to form two pancakes. 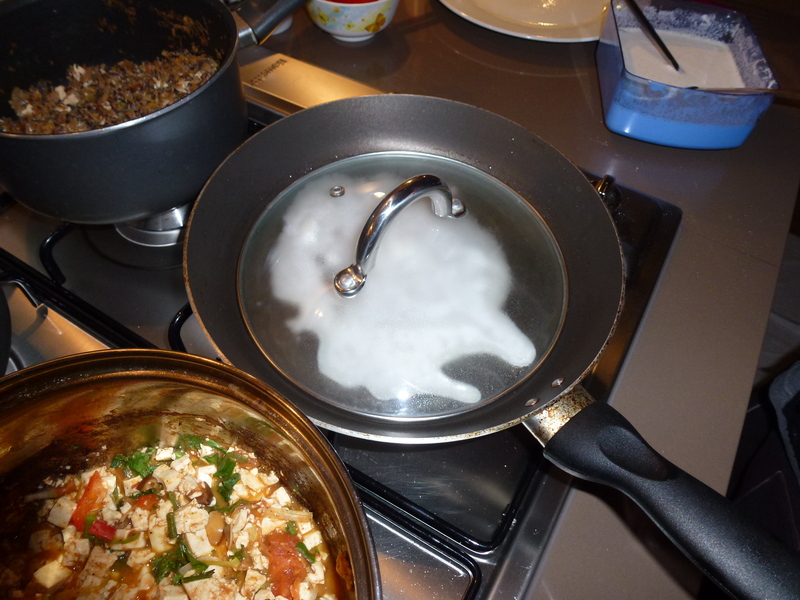 Along each edge spread half a tablespoon of the mixture thinly. 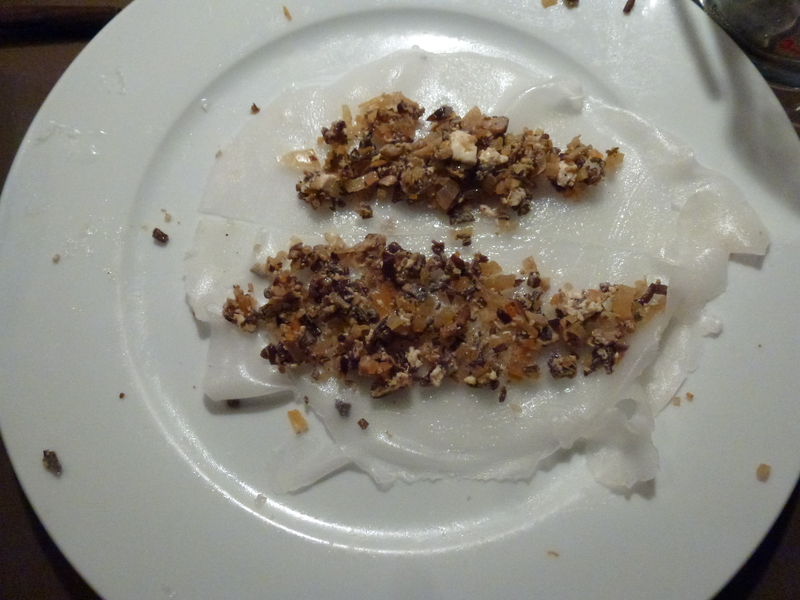 Roll the straight edge of each half over towards the curved edge once, rolling up the mixture in the process. Transfer to a serving plate and repeat with the other pancakes until all the pancake batter has been used. This entry was posted in Recipes, Vietnamese Recipes and tagged Asian Food, Bánh Cuốn, Cookery, Food, Mushrooms, Pancakes, Recipe, Rice Flour, Rice Flour Pancakes, Steamed Pancakes, Tofu, Vegetarian, Vegetarian Recipe, Vietnam, Vietnamese Food, Vietnamese Pancakes on February 1, 2013 by thejadecave.